As the links below attest I have never been sympathetic to John McCain in these pages. 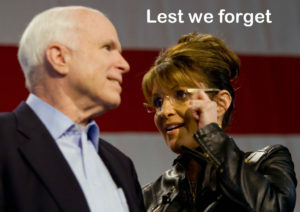 In fact, the only thing I ever agreed with Donald Trump about was that McCain was not a hero (his experience just did not fit the definition; survivor, yes, hero no). More definitively, someone who bombs civilians in a country that has not declared war on us, and is shot down and rescued by those people, is hardly a hero in my book. He did endure years of incarceration and “enhanced interrogation,” but killing people has consequences. I have been struck by how much he referred to himself, and has been referred to as “a true American.” On reflection, I think the term is apt; there’s something not very heroic about America, either.